Christmas holiday at the beach well why not? This unorthodox design is a clever mixture that shows that opposites do attract. 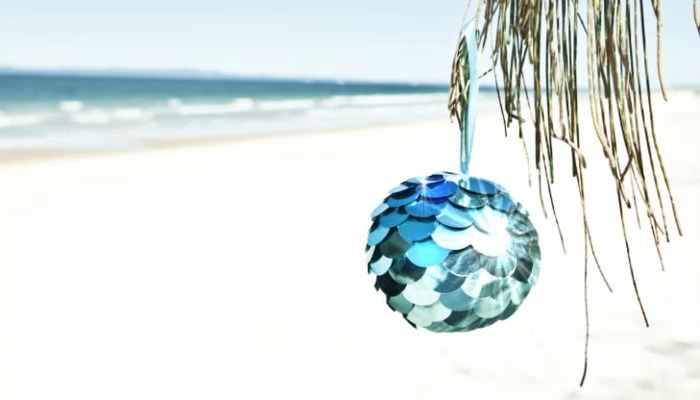 The beautiful beach landscape offers a zany contrast to the glittery blue bauble that instantly grabs your attention. The shimmers of light that flow over the bauble help highlight it and the way its dangling from the tree helps complete this off centre design. The striking colours of the sand and the clear sky contrast excellently with the shining blue bauble. No matter how odd this design may appear there is a quirky charm to it that makes it instantly likeable. This makes it the ideal design choice for holiday ecards for business and this odd yet charming design can be made even more eye catching with some added magic. This comes in the form of some small little sparkles that can be added to the lone bauble to make it more eye catching. This charmingly quirky design would be great for travel agencies or a business that are housed in tropical places. However if you would like a more quirky design but dont think this ones for you then we have a range of unusual corporate ecards designs for you to check out.